It’s Official – Princess Beatrice Of York Is Dating An Italian Count! 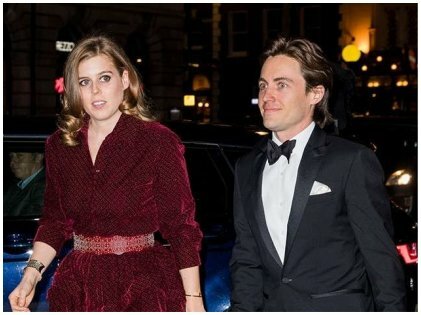 Thirty-year-old Princess Beatrice Of York is under the spotlight lately as she is the most eligible bachelorette right now in the royal family since Princess Eugenie got married. The elder daughter of Prince Andrew and Sarah, Duchess Of York, Beatrice is the eighth in line for the throne. After completing her education, she has been actively involved with various kinds of charities. Later, she started working full time and divided her time between London and New York City. However, what the public was really curious about was her love life. She had been dating Virgin Galactic businessman Dave Clarke for 10 years, but it all ended in 2016. And now, there is a new man in Princess Beatrice’s life! Rumors of Princess Beatrice’s love interest have been doing the rounds since November last year. However, they were not seen in public together only until recently. Along with a number of big names from various industries, Princess Beatrice of York arrived at this year’s glitzy gala hosted by the London’s National Portrait Gallery with her beau by her side. The handsome man is Count Edoardo Mapelli Mozzi whose father is ex-Olympian Count Alessandro Mapelli Mozzi. A divorcee at 34 years old, the handsome Edoardo seems to make Princess Beatrice happy, and the two are obviously smitten with each other. The star-studded gala was attended by Duchess Of Cambridge, Liam Pyne, David Beckham, and Jourdan Dunn, among others. The gallery is home to some stunning pieces of art. The place and the occasion were perfect for Princess Beatrice to introduce her boyfriend to the world. Looks like things are becoming serious between the two, and that thought itself has got us worked up. We are ready for another royal wedding in the near future. Hopefully, Princess Beatrice has finally found her Prince Charming! Troop Beverly Hills Is 30 Years Old Now, And We Are Still Obsessed! Drew Barrymore Shares Her Secret For Flawless Looking Skin! Guess Who Styles Princess Charlotte’s Hair? From Reality Show Star To Entrepreneur – Kristin Cavallari Has Come A Long Way!